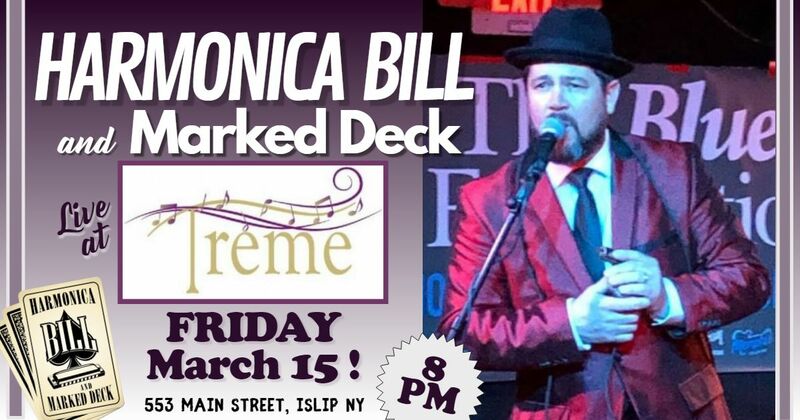 Harmonica Bill & Marked Deck return to TREME, finally on a Friday night! Fresh from representing Long Island in the International Blues Challenge, HB&MD is ready to lay down an evening of lowdown, greasy Chicago blues for your listening and viewing pleasure. Plus, the red suit from Memphis... it must be seen to be believed, and Harmonica Bill will be wearing it at Treme! TREME is a wonderful club and live music venue with great sound quality and we always play our absolute best there. The place is gorgeous inside and out and has a great wine selection, top shelf liquors, and lots of cool "small plates" to satisfy your appetite. TREME is located at 553 Main Street, Islip, NY.